I know I probably seem overcautious, but I like to play things safe when decisions affect paying members. 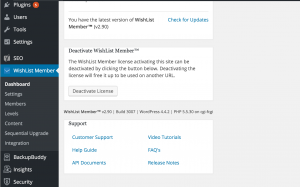 I’ve been watching the new version of WordPress (4.5) with WishList Member to be sure everything is going to keep working after an update. We’ve update a couple of our sites and have been in touch with clients and friends who’ve updated theirs. So far things seem to be running smoothly. One caveat, make sure you have the latest version of WishList Member which is 2.9.3007. To check open WishList Member / Dashboard and scroll to the bottom where you’ll see your WordPress version, WishList version. If you don’t have it and are not being prompted to download it log into your customer account at http://customers.wishlistproducts.com and download it.